The girls anxiously awaited the "TRUNK or TREAT" as they had been eyeing their pink pumpkins for weeks and Lexi told us over and over how she wanted to fill her pumpkin to the top with candy. They both were fairies this night as Lexi was dying to dress like her sister and we didn't have her Belle costume yet. Kylee was nice enough to go along for the evening as she specifically told us she didn't want to be the same thing as her sister this year. Everyone did a great job with their trunks and I am always impressed with each ward we have been a part of. One family even had automatic horses to ride which both girls got a kick out of. One of Kylee's highlights was Rob and Miranda's trunk when a HAND came out and grabbed her as she got her candy. Alexis quickly moved forward at this point and Kylee insisted on going back later. They even climbed in and tried themselves. They would have stayed in that trunk forever especially when their favorite babysitter, Riley joined them. Alexis was "BEAUTIFUL BELLE" at her preschool Halloween party and for Halloween. She was ecstatic when it came in the mail from her cousin Saylor and immediately put it on. It was worn every day that week. She thinks belle has the prettiest dress of all the princesses because it is silky and to her twirls the most. It was absolutely adorable watching her pick the front up so she wouldn't trip on it and listening to her request glitter and make-up every time the girls got dressed in their costumes. We had a great time together at her Preschool party. This was my first time getting to hang out in her class and we ate it up together. Many of the girls in her class dressed up as different princesses and she took it upon herself to name each one for me and was thankful there were no duplicates. With a little coaching she was willing to let me turn her into a Mummy and insisted on bringing home a roll of toilet paper to do it again. The Halloween treats were darling and Lexi had a blast handing out the treat bags she helped me make for each classmate. She kept asking when it was time to pass them out. 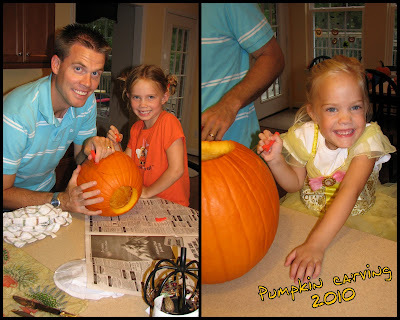 For the first time ever we finally took the time to trace the new intricate patterns on the pumpkins for carving and thankfully Skylar got into it as it is just not my thing. I will say they turned out pretty cool and we loved finally having a front porch to display them on. 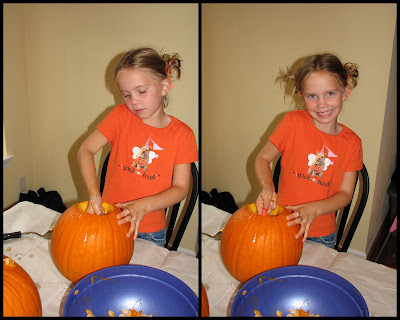 I love how Kylee gets so into everything we do and despite the gooey insides this year she dug in. I can't help but say...this girl is just so dang cute! Kylee was into the vampire teeth this year and when she finally got a pair she had a blast with them and couldn't wait to take them into class to show them off. My little fairy and princess made Halloween a blast and I loved getting them all ready. We still have candy left and I'm wondering when I will finally stop hearing can I have another piece of candy!!!! Your little girls are growing up. I love their costumes and their pictures together are so cute. I love how involved they can get in fun activities, even baking a cake! I love their messy buns! Lexi has some darling smiles in some of the pictures. The last picture you better print and keep forever - it is precious! I can't get over how much your girls have changed! They are so big and grown up! Cute little darlin's!